The redesigned Suunto DM5 allows you to download your dive logs for advanced analysis and upload detailed dive plans to your dive computer. For Suunto EON Steel owners, DM5 offers display customization and firmware updates. Suunto DM5 is available in English, Dutch, French, Finnish, German, Japanese, Korean, Spanish and Chinese. DOWNLOAD AND TRACK - After the dive, transfer you dive logs to DM5. Your dives are stored in the logbook where you can review, analyze and organize them by date, mode or device. PLAN & TRANSFER - With the Suunto DM5 graphical dive planner, easily create dive profiles, manage gases as well as backup plans. SUUNTO EON STEEL SUPPORT - Create and modify your EON Steel displays in DM5. Within just a few minutes you will be able to set up new dive modes and customize them as you wish. MOVESCOUNT - Suunto DM5 is also integrated with Movescount.com. Having your dive logs uploaded to Movescount you can view them online from anywhere you are, follow your progress, and add pictures and maps. NOTE: Please quit Moveslink software and unplug all Suunto USB devices before using DM5. 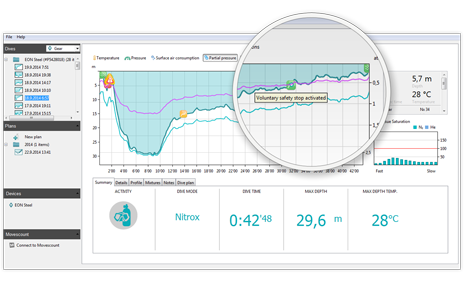 With a USB cable (included with some Suunto dive computer models), you can transfer recorded data such as dive profiles, maximum depths, temperatures, air consumption, and dive time directly from your dive computer to the DM5 software on your laptop whenever it is most convenient for you. Once the data is on your computer, get online and share everything with your friends on Movescount.com! At Movescount, you can then add text and photos of your dive locations, names of your dive buddies, equipment information, and more. You can view your past dives and get summaries of them, as well as any other activities you’ve uploaded. You are also able to explore the most interesting dives in the community and connect with other divers around the world.